Kyra and I have been going through the process to start foster care, and it requires extensive documentation of our lives and interviews about our childhood, personalities, and relationships. 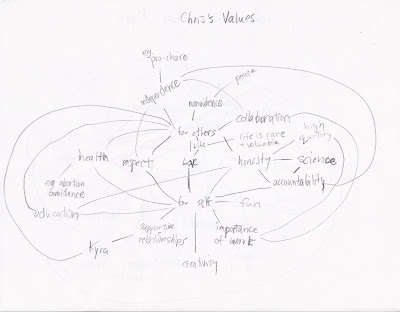 During this process, Kyra mentioned the fact that I have a diagram regarding my values. 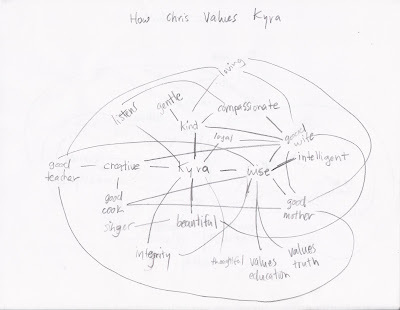 I value Kyra for her kindness, wisdom, creativity, beauty, dedication, and integrity. She's a good cook, mother, wife, and teacher. She is loving, compassionate, gentle, intelligent, and honest. I love when she sings and when she dances. She's a good listener, and she has a great sense of humor. May is Kyra appreciation month, with Mother's Day, our Anniversary, and her Birthday. Kyra, Luca and I love you dearly, and we wouldn't be the same without you. You make use whole. Happy Kyra Appreciation Month.